You may feel a new sensation from your eyes, your ears and your fingertip! ! 2017/4/29 SR Fullvoice Ver3.15 released. 2017/3/27 SR Fullvoice Ver3.14 released. 2016/10/6 ShadowRine English website renewed. 8/18 SR Fullvoice Ver3.13 released. 5/5 SR Fullvoice Ver3.06 released. 4/30 We opened 8 pieces of secret password. SR Fullvoice Ver3.04 released. 4/26 SR Fullvoice Ver3.03 released. 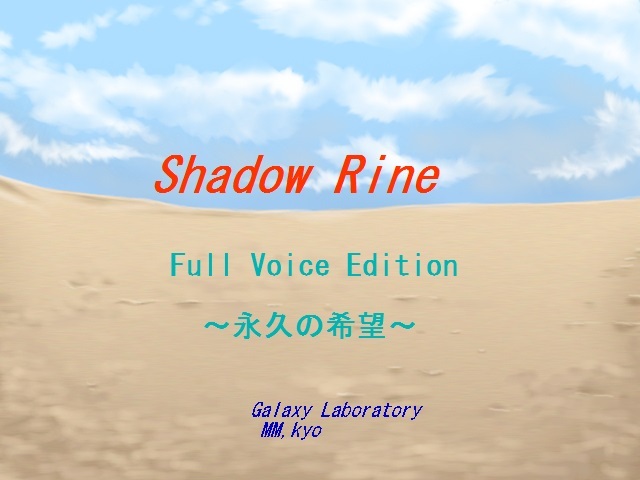 4/13 SR Fullvoice Ver3.02 released. "ShadowRine" is the action role playing game. This game is Japanese. However, We are translating into English little by little. Finally, We'll translate all system messages and all stories. © Copyright Translated by Tsunderera. © Copyright 2009-2017 "Galaxy Laboratory" All Rights Reserved.